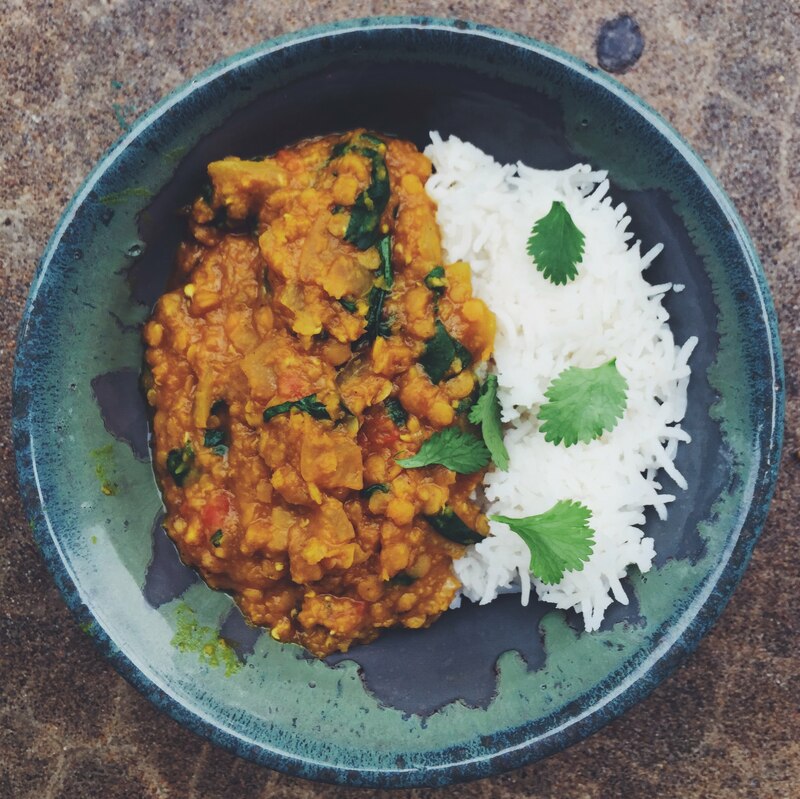 When I first moved to a new house in Aberdeen, my friend Claire made these curried red lentils out of what I happened to have in my pantry after we had unpacked it. I watched in amazement as she produced this gorgeous dish for dinner from what I had around. It remains one of my favorite dinners to make as the dry ingredients are easy to have always on hand. Also, you can use tomato paste if you don’t have tomatoes or lemons if you don’t have ginger. Making substitutions based on what I happen to have is part of the beauty of this meal. And it always reminds me of my friend Claire and her willingness to help me turn a rather quirky old house into a home. After we eat this meal, we package up the leftovers into lunches for the following days as the flavors seem even more rich the next day. Bring the 2 cups of lentils to boil in 4 cups of water. 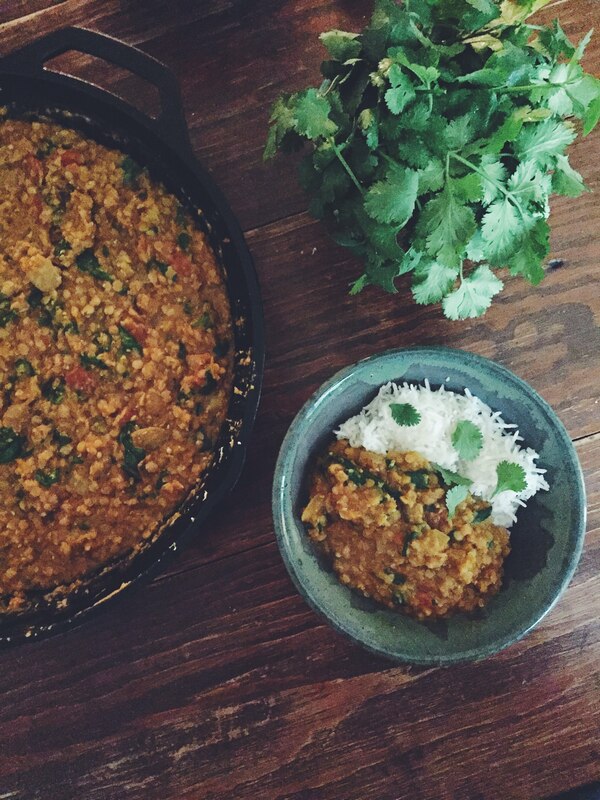 Reduce heat and let simmer until lentils have absorbed water (10-20 minutes). While lentils are cooking, melt butter (or Ghee) in a large skillet. Sauté onion for 5 minutes. Add garlic and ginger. Cook two more minutes. Add all the spices and cook a minute or so to allow the mixture to turn into a thick paste. Add the tomatoes and a little water if mixture is too dry. 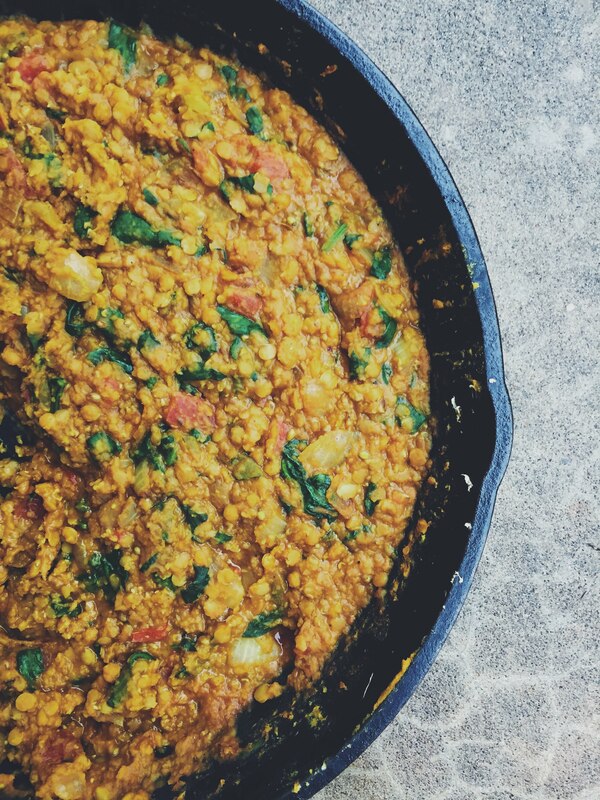 Once the tomatoes are hot, add the spinach and the lentils. Stir until mixture is hot. Only allow the spinach to barely wilt. Serve immediately with rice and your choice of toppings.